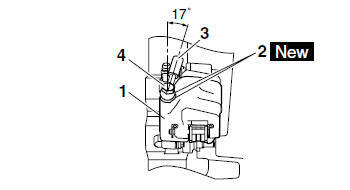 Brake hose union bolt "4"
Install the brake hose at a 17 angle to the front brake caliper as shown in the illustration. While holding the brake hose, tighten the union bolt. Refer to "REPLACING THE FRONT BRAKE PADS" on page 4-22. When refilling, be careful that water does not enter the brake master cylinder reservoir. Water will significantly lower the boiling point of the brake fluid and could cause vapor lock. Brake lever operation Soft or spongy feeling → Bleed the brake system.